IKA’s labworldsoft® 5.0 software package provides an advanced, multi-purpose software platform for the measurement, control and regulation of laboratory equipment and instrumentation. The software enables up to 64 devices to be networked via a single PC, meaning that laboratory processes and experiments can be automated easier and more efficiently. All processes and measurements can be run independently. Not only does the software integrate IKA laboratory devices as standard, but it also supports devices from other manufacturers; ensuring smooth operation, increased productivity and reduced processing times. Communication between the PC and laboratory devices is performed via the serial interface using RS 232 (COM1 or COM2) protocols. 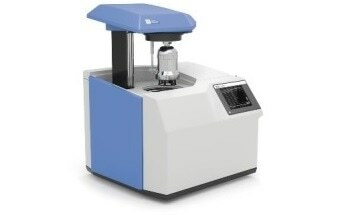 The labworldsoft® software allows many physical parameters (such as temperature, speed, torque, pH etc.) to be recorded quickly and easily. These can then be represented on a y/t graph for more efficient data analysis and documentation. The labworldsoft® software is compatible with Windows 98/2000/NT/XP/7 and requires at least 16 MB of RAM with 20MB hard drive space available. A mouse is required, and VGA display and COM ports can be upgraded where required. 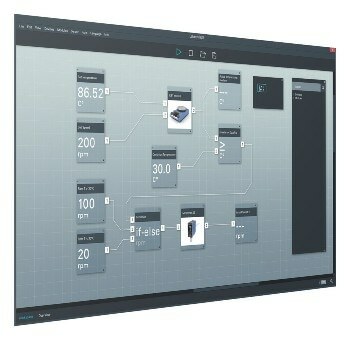 labworldsoft® allows up to 64 instruments to be networked simultaneously via a single PC. All research and development processes can be automated, from sample preparation through to synthesis. Speed and temperature sequences can be controlled using freely selectable ramp functions. This not only offers precision control of these settings; but these ramp functions can be graphically generated, stored then loaded again at any time to repeat the process quickly and conveniently. labworldsoft® allows quick and easy recording of many laboratory-standard physical measurements such as conductivity, pH, temperature, weight, torque or pump rates. The labworldsoft® software is able to export any acquired data into standard applications. For example, data measuring speed during a test can be saved in a standard format (plain text or ASCII) and then imported into a suitable piece of software (such as Microsoft Excel) for analysis. All test arrangements can be stored within the labworldsoft® software meaning that tests can be easily reproduced with just a click of the mouse. The reproducibility of tests is warranted within the scope of ISO 9000 and GLP. All results, as well as the measurement flowcharts themselves, can be printed or plotted according to GLP, QA and ISO; meaning that the generation of appropriate documentation is a straightforward process using the labworldsoft® software.